Dr. Heather Cox Richardson, Professor of History at Boston College, and an expert on American political and economic history. She is the author of five books and is a national commentator on American political history and the Republican Party. Her work has appeared in such outlets as The Guardian, the Washington Post, the New York Times, and the Chicago Tribune. She also co-hosted last year’s weekly WBUR politics and history podcast, “Freak Out and Carry On” along with Pulitzer Prize-winning journalist Ron Suskind. She is currently at work on How the South Won the Civil War: A History of Democracy and Oligarchy in America. Her lecture will take place in the auditorium of the Russell Special Collections Libraries Building. 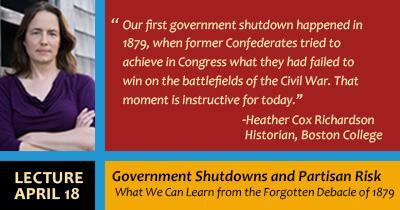 She will explore the partisan nature of recent federal government shutdowns by recounting the forgotten history of the nation’s first government shutdown in 1879. A reception will follow the event. This lecture is part of the Russell Library's annual observance of Congress Week, an event created by the Association of the Centers of Congress in 2009 to promote a better understanding of the U. S. Congress. This event is made possible by generous support from the Russell Programming Endowment, the School of Public and International Affairs (SPIA), the Department of History, and the Applied Politics Certificate Program.